I just saw it for the first time and got the most recent image. I'll try clearing the cache. What scares me is that sand castles are notoriously ephemeral. Maybe this means his wife is not long for this world. Together they built a glorious sandcastle, then the sea has come and washed it away. After sitting for ~15 minutes both of my browsers caught up with the latest image. Maybe there is a quirk with the first image, or maybe it was a fluke. Okay... finally gave in. Registered just for this. Randall is an absolute master. But what makes this place so great is the fan base. I feel like I belong to a secret club that's open to anybody. Just looking at the most recent image when I thought that might be the whole comic, I thought it was a real work of art. 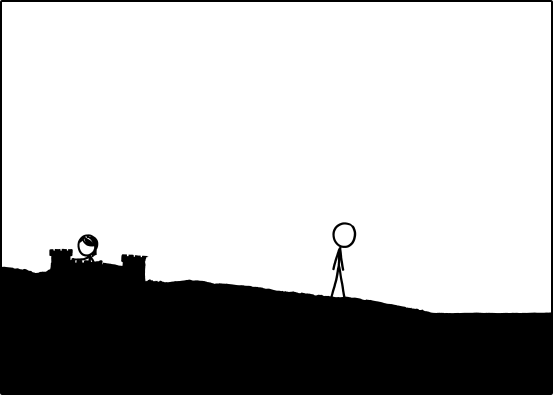 Maybe it's possible for it to have this effect because of the whole context created by xkcd for itself? we're just waiting...we don't know what we're waiting for exactly, but we're waiting. What if this is real-time time-lapse photography of their vacation on the beach processed through a stick-figurizing filter that Randall has written for Gimp? What if he hasn't drawn anything for years and has just posted processed photographs all along while we all thought he was an artistic genius? bugstomper wrote: What if this is real-time time-lapse photography of their vacation on the beach processed through a stick-figurizing filter that Randall has written for Gimp? What if he hasn't drawn anything for years and has just posted processed photographs all along while we all thought he was an artistic genius? But would that mean we'd have to take "Aspect Ratio" literally? Does he have cars he can just squish like that? Hitting a target that no one else can is skill. Genious is hitting a target no else have seen. I predict that Randall will keep updating this for a long time, at least a few weeks. Um, did it just go back to the beginning, or did I do something wrong? He seems to be more concerned with the water in the last couple of frames. Is it rising? Is there something/someone coming from there? 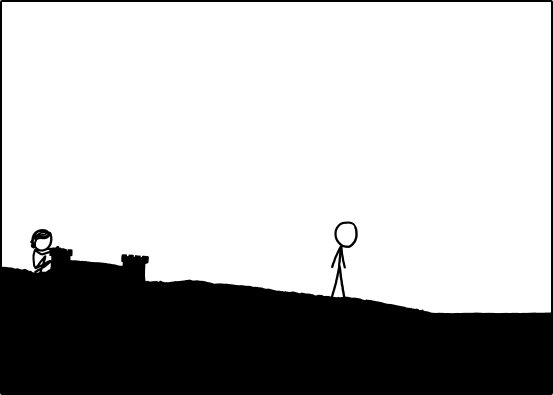 So today I was bored and thought, "hey, I haven't seen XKCD in weeks! let's check it out now"... I WAS NOT EXPECTING THIS. After "Click and Drag" a command like "Wait for it" made sense, so I waited. Randall, you evil genius, I love this so much. I hope you're having fun reading all about us freaking out over this. I may be wrong, but I think he's using local time hashing. Time.png isn't an image at all - it's a phyton/php/[insert your flavor of server-side interpreter here] script. It proceeds to obtain the local server time, and passes it through a hashing algorythm that generates values like 6482bafdc122a24f837eb45ac530c7f7f3f54adfb3f309061520c394f895b184. I'm pretty sure this isn't Base64, and the lack of letters other than A-F indicates it's hexadecimal - so i'd bet it's two or three pseudo-random UUID joined together. So he first generates a bunch of future values, rename the local files according to the moment he wants them to come up. There is no need for cookies, since the value is generated server-side. Did anyone notice that the water one the first panel was slightly messed up then it leveled out? that they just watched something depart and are waiting for it to come back. Humans don't need sleep, right? This is far better than Pope Watch. If that's the case, he'd be more of a genius than even this gives credit for, since he would have also had to write the part of the script that syncs the sounds from the microphone next to (or part of) his camera, speech-to-text it, and assign it to the person in the filtered image that must have said it. Or maybe there's always text floating above our heads when we talk, and his camera just has a special lens on it that captures them :O Or maybe its just a script that contextualizes the stick-figurized picture by adding snippets of conversations it deemed funny by some complex, humor/romance/science learning algorithm that learns from searching the internet. Actually, that makes the most sense, as the updated map of the internet shows this massive change in its understanding of the internet. TheMulattoMaker wrote: But would that mean we'd have to take "Aspect Ratio" literally? Does he have cars he can just squish like that? 1) This statement is false! 3) Does a set of all sets contain itself? has anyone managed to compile a complete list of images that have been uploaded so far for this one ? Okay, she's either working on the far wall of the castle, or she decided to live in it. The water has risen 3 pixels in one day. The base of the castle is 29 pixels above the top of the water. It looks like the castle has no more than 10 days to live. The water is also quite a bit rougher. Last edited by bouer on Tue Mar 26, 2013 3:44 am UTC, edited 1 time in total. PhoenixRising wrote: What is this sleep you speak of? There is only the castle. All must yield to the castle. If it's of interest to anybody, the tiny text at the bottom with his regular "The algorithm..." stuff has a new line of encrypted code at the top. Current line reads "BTC 14FHqYSgAi39CEJksUJJsK8JzJzyqFpLVk"
Are we seeing the past? Maybe they sent out the boy from #1. Maybe he's returning with a ferret riding a biplane? http://xkcd.aubronwood.com/ is updated through current, though my auto-update stuff isn't working, so if this goes past midnight it will lag behind significantly for a little while, until i make a proper auto-updater tomorrow. Creator of xkcd.aubronwood.com, AKA The Book of Aubron. Reddit Moderator, Web Developer. Male. Ok so I had to register for this! First of all, I am quite enjoying watching this unfold. Thank you very much to the creators of the GIFs! Now, as for the water line, I think it's been constant. If you zoom the GIF, you'll notice the baseline is 2 pixel rows, one base white on top of one base black. They both get shades of grey from time to time, giving it the undulation effect we see. But those 2 pixel lines are the same from start to finish, so far. TheNerdMeister wrote: Are we seeing the past? Maybe they sent out the boy from #1. Maybe he's returning with a ferret riding a biplane? Hey, I just realized, some people get the first frame for a fraction of a second before it reverts to the current one. Could someone this has happened to check their browser cache? It records URLs along with the picture itself. I have been trying, but I cannot replicate the situation that causes the first frame to appear. EDIT: Actually, It looks like people already found it. I must have missed a chunk of posts earlier. My apologies. Last edited by Nicad on Tue Mar 26, 2013 3:57 am UTC, edited 1 time in total. Possibly... Maybe it could apply as the title text? That Randall is challenging us? Would it be overhang text? With the stick figures are challenging the sea to stop them and their castle? I can't help but wonder about the potentially tragic nature of this...my thought at the last frame was that he was staring off into the distance, contemplating the girl who now appears to be living in a castle that is destined to be destroyed. Doesn't take much to think of his wife in this one...I hope she's alright. Either that or this is an ingenious plan to get more people to register on the forum. Nobody Misses Me As Much As Meaux. Looking at the js file as a block of text, it looks like it takes a rather circuitous route to update the file based on some complicated but arbitrary factors. A catch-me-if-you-can, if you will. Seriously somebody must have noticed this already??? Sungura wrote: I don't really miss him. At all. He was pretty grouchy. She's gonna get mad pretty soon, he's making her do all the work. Also, it's now been a full day and it hasn't looped. I'm guessing it'll run for another 24 hours, until Wednesday's strip comes out? Maybe longer, but I doubt it. Is the sand getting more roughed up over time as he walks over it?